Thought Leader » Sleepwalking into a geophysical storm? All the decisions we make, for better and worse, will be theirs to live with. And these descendants will have their own families: hundreds of millions of people not yet born, most of whom you or I will never meet. The rest of this thought-provoking article testifies to the fact that, clearly, not many people on planet Earth today often arrest the frenetic pace of their media-saturated lives to spare a thought for our descendants’ plight by century’s end. Judging by the fact that even the World Economic Forum — host of the global elites’ annual gathering at Davos, Switzerland — displays severe misgivings about global society’s future, Fisher’s article should be taken very seriously by everyone among us who is in a position to influence ‘leaders’ and policy-makers in political and economic circles. Anyone who is open to the abundant sources of information around us should sit up and start doing their bit to contribute to a sense of urgency about a set of geophysical conditions that will, UNAVOIDABLY, hit humans like a gigantic rotten pumpkin in the not-too-distant future. It cannot be otherwise, judging by all the un-ignorable signs that Fisher’s article is spot on. Take this article about fracking, which is destroying a beautiful area in Patagonia, Argentina, for example, with its shocking visual evidence of the destruction of pristine natural environments by that detestable, water-poisoning practice, fracking. If the human species were capable of, and inclined to consider the long-term consequences of eco-destructive practices such as fracking, instead of opting for short-term economic profit, this would never happen. I deliberately did not use the word, ‘ecological’, or ‘environmental’, in the title of this piece, because I know that people tend to avoid reading articles on the looming eco-disaster because it makes them feel understandably helpless. But when phrases like ‘sleepwalking into disaster’, or ‘oil-soaked land poses health risks’, start cropping up more and more, and one is informed, over and over, that the president of the most powerful country in the world is unconcerned about all these accumulating danger signals, while others (notably the new Brazilian president, Jair Bolsonaro) are following his example, then one realises with a shock that we are inviting a future where our present ways of living will be NO MORE. Planet Earth, creation, the world in which civilisation developed, the world with climate patterns that we know and stable shorelines, is in imminent peril. The urgency of the situation crystallised only in the past few years. We now have clear evidence of the crisis, provided by increasingly detailed information about how Earth responded to perturbing forces during its history (very sensitively, with some lag caused by the inertia of massive oceans) and by observations of changes that are beginning to occur around the globe in response to ongoing climate change. The startling conclusion is that continued exploitation of all fossil fuels on Earth threatens not only the other millions of species on the planet but also the survival of humanity itself — and the timetable is shorter than we thought. But the climate and species story does not need to be one of gloom and doom. As E. O. Wilson, the Harvard biologist, explains, there is a potential path in which the species we have today would survive. Wilson suggests that the twenty-first century will be a “bottleneck” for species, because of extreme stresses, especially climate change. However, if we stabilise climate by moving to energy sources beyond fossil fuels, and if the human population begins to decline as developing nations follow the path of developed nations to lower fertility rates, then a brighter future is possible, a future in which we learn to live with other species in a sustainable way. How likely is it that humans will take this route of insight and, more importantly, foresight? 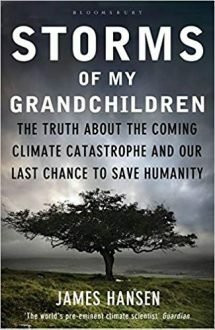 Not very likely, considering that Hansen’s book appeared 10 years ago, and in the interim nothing positively significant has happened; on the contrary, all the significant events have been negative, such as that buffoon Trump’s withdrawal from the Paris climate treaty. Do we see a concerted move away from fossil fuels? No — the oil companies are still pumping oil instead of substantially investing in alternative energy sources, and although car manufacturers have started producing electric cars – which are not environmentally neutral either, by the way — the pace is too slow, and the cost to consumers too high to make a meaningful difference. And as for the burgeoning global population – which is far too numerous to be sustained by planetary resources — there is no world ‘leader’ I know of who has had the guts, and ethical resolve, to tackle it head-on, as Hansen does here. ERGO: PREPARE FOR THE WORST. We are going to have to live underground sometime in the future, when the surface of the planet becomes uninhabitable, like in some dystopian futuristic science fiction movie. And we are going to have to find alternatives to water from rain, because ‘water-wars’ will become commonplace. If this sounds far-fetched, consider that there are parts of the world where people already fight over water-sources. Not a nice picture. And it is getting worse all the time. We must act now, or forever hold our breath. Previous post: ‘Dark technology’ and human ‘nature’ or ‘nurture’? Next post: Ag sies man! They took toilet money!